I took my first yoga class in 1992. It was a 6 week community education class. I fell in love instantly! 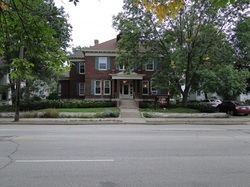 I then went on to take weekly classes at the Meditation Center in Minneapolis. I first started my yoga training journey with the Himalayan Institute teacher training at the Meditation Center in Minneapolis, MN. Winter 1997. I went through half of it, but then put it on the "back burner" due to the pregnancy/birth of my 2nd child. My next teacher training was Integral yoga, at Swami Satchidananda's Ashram in Buckingham, VA (called "Yogaville") in the Spring & Fall of 2003. I was there for two 2 week sessions (200 hours),Earning my Certification as a yoga teacher. A picture of the beautiful Lotus Temple at the Ashram. Dedicated to the worlds religions, "Truth is One, Paths are Many"
​winter and summer of 2006. Gaining 200 more hours of instruction. I spent a total of 18 hours learning and practicing with amazing teachers. 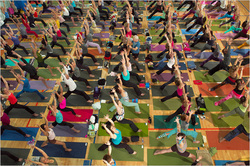 In 2011 I went to the New York City Yoga Journal conference. I took in an all day seminar with the queen of Restorative Yoga, Judith Hanson Lasater and spent another day with Saul David Raye learning thai yoga massage. PLUS the other six, 2-hour sessions with other great teachers. For a total of 24 hours of instruction. I attended this conference in the summer of 2011. I took workshops with Lilias Folan( the grandmother of yoga in USA), Sean Johnson (bhakti & chanting), Marsha Wenig(kids yoga), Julie Gudmestad(anatomy,core strengthening). 18 hours of instruction. In the summer of 2012 I traveled to San Diego to attend the YOga Journal conference. This time i had classes with Bhava Ram, Steve Ross(Holotropic breathing),Marla App(yoga for the neck and shoulders), Jill Miller(embodoed anatomy-bony landmarks & fascia geography),and Claire Diab(Chair yoga). 18 hours of instruction. 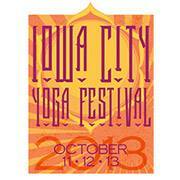 This yoga festival was in the fall of 2013. Here I studied with Tao Porchon Lynch(the 95 year old yoga teacher! ), Faith Hunter (power vinyasa), Jill Abelson(anatomy), Hari Kritana(Yogic philosophy) and Andrey Lappa. It was a great experience, so close to home! 18 hours of instruction. Winter of 2014 I completed a Lifelong learning course in Anatomy & Physiology. I gained a complete, basic knowledge of the systems of the human body. 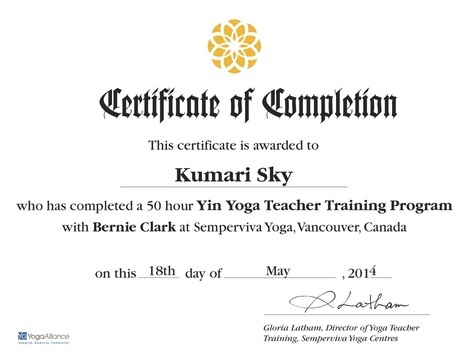 Spring of 2014 I completed the Semperviva Yin yoga teacher training with Bernie Clark in Vancouver, BC. It was a 50 hour training that included 17 hours of anatomy, physiology & the energy body, 12 hours of asana theory, plus meditation, teaching practicum, and actual yin yoga practice. It was an amazing experience that took me to a new level of understanding the human body and how it works in relation to yoga. With my teacher Bernie Clark and his assistant Diana. I had the good fortune of being able to train with the amazing Camella Nair. She offered an 18 hour Aqua Yoga teacher training in Madison in January of 2015. I am so happy to have gained the skill of translating a yoga practice into the water. I am now able to reach so many more that may not find a traditional "land" yoga practice accesible. In the Fall of 2016 I completed 40 hours of training for the STRIVE program in Vernon and Crawford counties. This means, yoga is now available as a healing modality for recovery! ​ Here is an overview of the program: "Comprehensive Community Services (CCS) is a program for individuals of all ages who need ongoing services for a mental illness, substance use disorder, or a dual diagnosis beyond occasional outpatient care, but less than the intensive care provided in an inpatient setting. The individual works with a dedicated team of service providers to develop a treatment and recovery plan to meet the individual's unique needs and goals. The goal of this community-based approach is to promote better overall health and life satisfaction for the individual. As of September 30, 2016, the latest data available, 4,263 individuals were enrolled in CCS." Summer 2017 I went back to my beloved Guru's ashram and did the Meditation teacher training. I had the most wonderful experience learning from and spending time with Sri Gurudev's most senior disciples as my teachers. Here I am with Swami Kurunanandaji-her humor, wisdom and amazing light inspires me everyday. I am so blessed to be her student.